Two former glory teams will face each other in Sunday night’s prime time game, starting at 8:30 pm ET in At&T Stadium in Dallas. 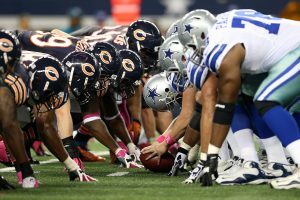 The Chicago Bears were once a defensive power house while the Dallas Cowboys were America’s Team, but that was then and this is now. The main difference this year, is Dallas has acquired a lot of young talent for their offensive lineup and is looking like they are on their way to rebuilding and gaining their glory days back, the same cannot be said about the Chicago Bears despite some major overhauls in their lineups. Other more impactful injuries will affect the Chicago defense; these include linebacker Danny Trevathan; a weakened defensive lineup will greatly favor QB Dak Prescott and RB Ezekiel Elliott as well as wide receivers Dez Bryant and Cole Beasley, looking to find redemption in this game will be Dallas’s wide receiver Terrance Williams who was partly responsible for the Cowboys loss in week one, and was shunned in game two as a result. He continues to impress, in last week’s win against the Washington Redskins, he completed 22 of 30 pass attempts for a total of 292 yards and one rushing touchdown, so far this season he has completed 62.7% of his passes and has accumulated a total of 519 yards and he has yet to throw an interception. He is expected to play instead of Cutler this week, the former Texans quarterback seems to have earned his team’s respect and is well liked, then again like I mentioned before this may have more to do with Cutler being absolutely abhorred than Hoyer being a nice talented guy. He could end up surprising everyone by putting up some great numbers but this seems highly unlikely given the state of complete disorganization the Chicago franchise seems to be in. So far this season they have been averaging just 14 points per game, and although Dallas does not have the best defense in the league by any means, they should be able to hold the Bears offense in check. It seems clear the Cowboys are poised to be the victors in this game, which will put them in a 2-1 position, but the real question is, will they be able to cover the spread of -7.5? I would not have hesitated to say yes if the starting quarterback were Jay Cutler, but with the uncertainty of how Hoyer might perform I’m not so sure. My recommendation for this NFL football betting game will be to bet a teaser Dallas to the Over. For the latest NFL odds visit www.AceSportsbook.com.